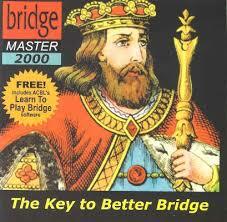 Bridge Master was Fred’s first software product. It is amazing! It gives you 180 hands and it watches you closely as you play. You choose the cards you play and the computer decides if it likes your play. The computer does things like giving East the queen of hearts the first time you play the hand and giving it to West if you try another, but incorrect line. You never know where that queen will pop up next. Bridge Master will sharpen your game and keep you occupied for hours.